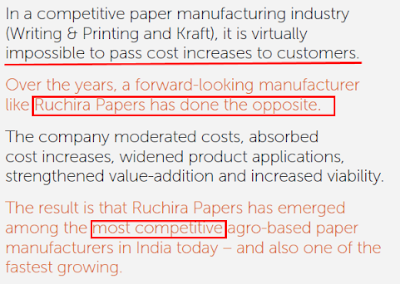 This article provides in-depth fundamental analysis of Ruchira Papers Ltd, a north India based paper manufacturing company dealing in writing & printing paper and kraft paper (packaging paper). Hello Dr Vijay Malik Sir, Congratulations and thank you for a wonderful blog on fundamental analysis. Can you please give your insights on Ruchira Papers Ltd.? 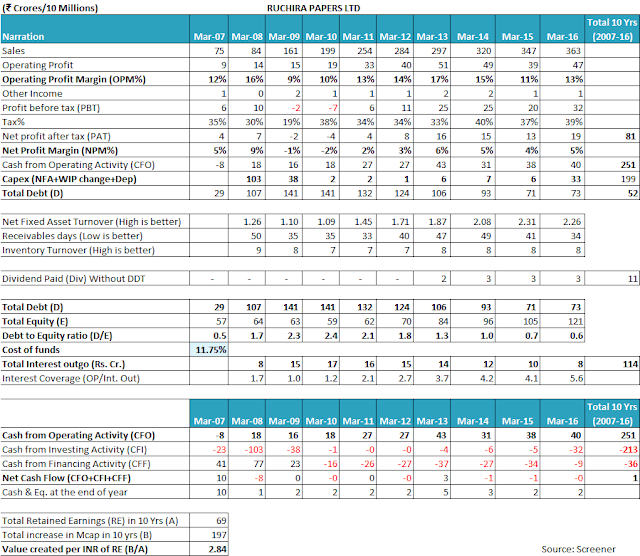 I have attached my analysis, checklist summary. The Company is engaged in manufacturing of Writing & Printing Paper which is used for manufacturing of Note Books, Publications etc. and Kraft Paper which is used as a Raw Material in Packaging Industry. The factory is based in Himachal Pradesh close to Baddi, which is an important centre for FMCG and Pharma manufacturing. India ranks fifteenth among paper producing countries in the world with a total installed capacity of approximately 12 million tonnes per annum. Even as paper consumption has steadily increased, India’s per capita consumption has remained at a meagre 10 kilograms compared to the global average of 60 kilograms. The paper industry in India is primarily categorised into W&P (writing and printing), paperboard and newsprint segments. India is nearly self-sufficient when it comes to the indigenous production of most varieties of paper and paperboards, even as certain varieties of specialty papers are imported. Despite accounting for 17% of the global population, India accounts for a mere 3% of the world’s paper and paperboard production, a reflection of its low literacy. The estimated turnover of the industry is Rs. 35,800 crore and provides employment to more than 370,000 people directly and 1,300,000 indirectly. Growth should be consistent year on year. Ignore companies where sudden spurt of sales in one year is confounding the 10 years performance. Tax rate should be near general corporate tax rate unless some specific tax incentives are applicable to the company. Increase in MCap in last 10 yrs. > Retained profits in last 10 yrs. Company should have shown good project execution skills with cost and time overruns. Company should be either a pure play (only one business segment) or related products. Pure play model ensures that the management is specialized in what they are doing. No cap on profit returns or pricing of product. The Company has been upgraded from CARE BBB- (TRIPLE B -) to CARE BBB (TRIPLE B) assigned to Long term facilities and CARE BBB/CARE A3+(TRIPLE B/ A THREE PLUS) assigned to short term facilities of the Company. Increase in promoter stake by 6% in last 5 years. Many thanks for sharing your analysis of Ruchira Papers Ltd with the readers and the author. I appreciate the time & effort put in by you in the analysis. 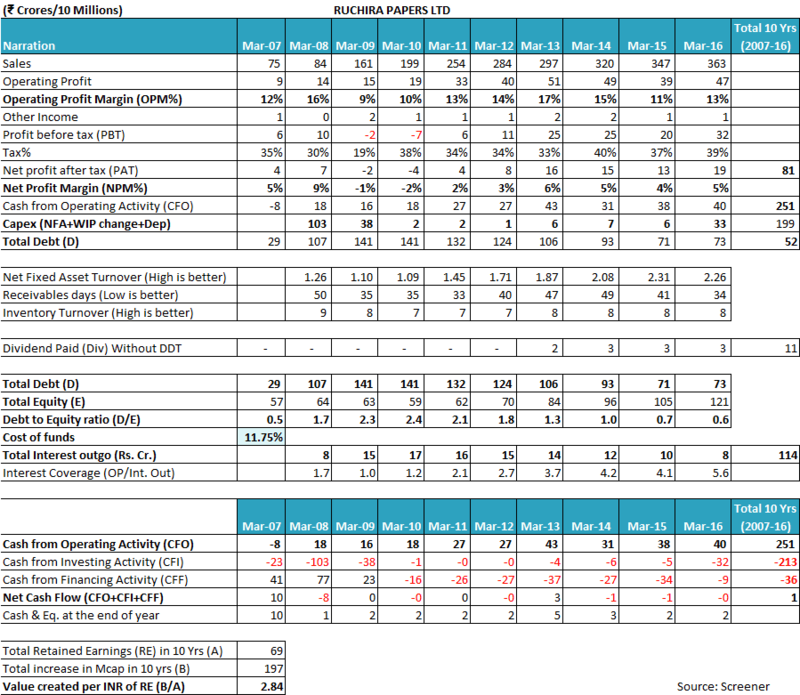 It gives a pleasure to see that you are using the Screener.in compatible stock analysis excel template available at our website. Let us analyse the financial performance of Ruchira Papers Ltd over last 10 years. Ruchira Papers Ltd had been growing its sales at a good pace of 19% over last 10 years (FY2007-16). However, as the size of the company is increasing the pace of sales is going down year on year. The sales growth has toned down to 12% in last 7 years (FY2009-16) and further down to 7% in last 5 years (FY2011-16). As per the company, it has undertaken debottlenecking of its existing plant capacity towards the end of FY2016, which might lead to the growth rate picking up in future. However, it remains to be seen to what extent the company would be able to utilize the increased capacity. As per the H1-FY2017 results declared by Ruchira Papers Ltd, it has achieved a sales growth of about 9% over the previous year. 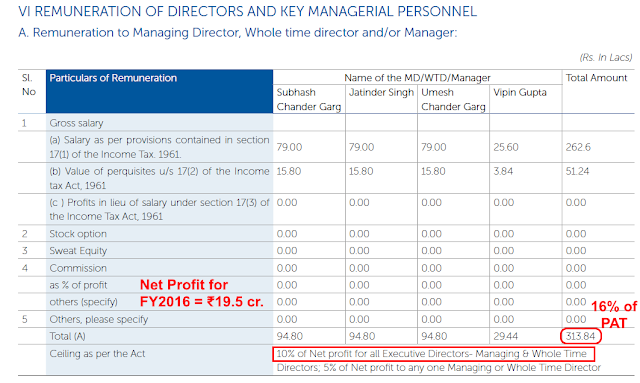 A look at the profitability trend of Ruchira Papers Ltd would indicate that both the operating profitability margin (OPM) and net profit margin (NPM) have been fluctuating widely during last 10 years (FY2007-16). Operating profit margins (OPM) have been varying from 12-9-17-11-14% over the years and similarly, net profit margins (NPM) have been fluctuating from -2% to 6% over the years. Such fluctuating margins are characteristic of companies, which have low bargaining power with their customers. In such businesses, companies find it difficult to pass on the increase in raw material costs to their customers quickly and thus take a hit on their profitability margins. The above chart clearly depicts that the operating margins of Ruchira Papers Ltd have been fluctuating more or less in the same manner as the margins of most of its peers like JK Paper, West Coast Paper, Emami Paper etc. 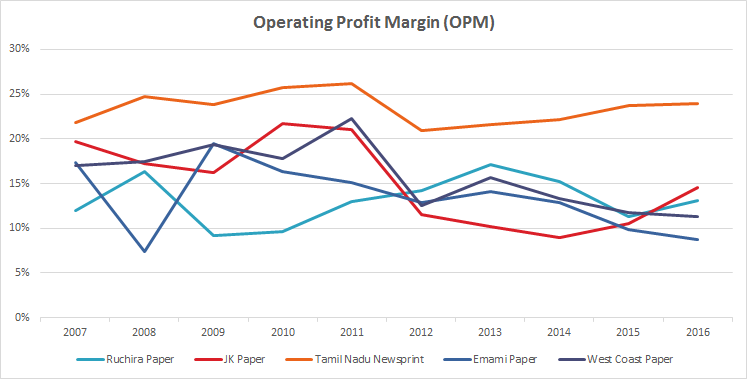 The only paper manufacturer to stand out in terms of stable margin out of the five players is Tamil Nadu Newsprint & Paper Ltd, which without doubt has the most stable as well as the highest operating profitability margins out of the five key players. The above comparative analysis also indicates that the Ruchira Papers Ltd is not the most competitive paper producer in the country. Many other players e.g. Tamil Nadu Newsprint & Paper Ltd are more cost competitive than Ruchira Papers Ltd.
Over the years, the tax payout ratio of Ruchira Papers Ltd has been consistently above 30%. However, as per the company, it has been availing multiple tax benefits including income tax benefits due to the geographical location of its factory. 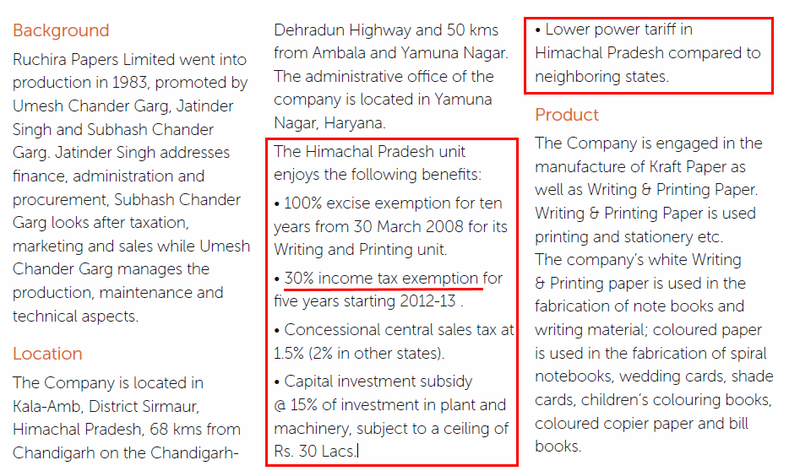 Ruchira Papers Ltd has provided details of the various incentives available to the company at pg. 5, FY2016 annual report. The income tax payout rate is expected to be lower than standard corporate tax rate due to the 30% income tax benefit available to the company. The company is not the most cost competitive despite availing lower power costs (due to incentives as well as co-generation plant) as well as excise duty benefits. Operating efficiency parameters of Ruchira Papers Ltd reflect that it has been able to improve its net fixed assets turnover (NFAT) over the years. NFAT has improved from 1.09 in FY2010 to 2.26 in FY2016. Inventory turnover ratio (ITR) of Ruchira Papers Ltd has been almost stable at about 7-8 times over last 10 years. Receivables days have been fluctuating wildly over the years. It has shown sharp improvement in FY2008, when receivables days improved from 50 days to 35 days. However, since then the receivables days deteriorated to 49 days in FY2014 and have now improved to 34 days in FY2016. 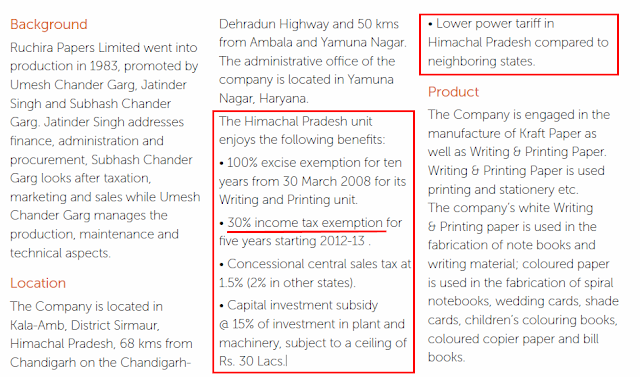 Ruchira Papers Ltd has proudly claimed in its FY2016 annual report (pg. 9) that it has been performing better than its peer in terms of receivables days and inventory management. 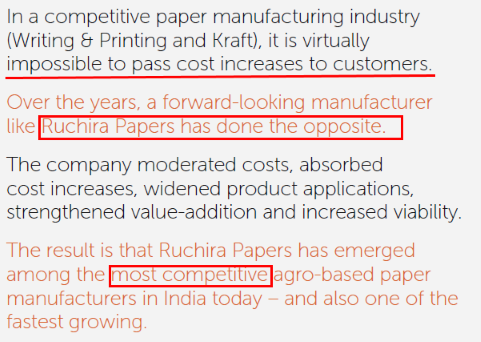 However, when we compare the receivables days of Ruchira Papers Ltd with its other peers (JK Paper, Tamil Nadu Newsprint, Emami Paper and West Coast Paper), then we come to know that other peers like JK Paper and West Coast Paper are performing better than Ruchira Papers Ltd. 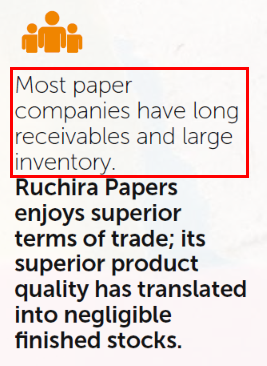 However, among the peers compared, Ruchira Papers Ltd along with JK Paper has the best inventory management. When we analyse the cumulative profits and cash flow data for 10 years (FY2007-16)), then we realize that Ruchira Papers Ltd has been able to convert its profits in to cash flow from operations. Cumulative PAT during FY2007-16 is ₹81 cr. whereas the cumulative cash flow from operations (CFO) over the similar period has been ₹251 cr. Conversion of profits into cash is a good sign for the investors. Over last 10 years (FY2007-16), Ruchira Papers Ltd has done a capital expenditure (capex) of ₹199 cr. which was primarily concentrated in FY2008 & FY2009 (₹141 cr.). Ruchira Papers Ltd relied primarily on debt to meet this capex, which led to the debt levels rising to ₹141 cr. In FY2009. However, over the years the company has refrained from doing such debt funded capex and has accordingly used the cash generated from operations for reduction of debt. As a result, the total debt of Ruchira Papers Ltd has reduced from ₹141cr in FY2009 to ₹73 cr in FY2016. 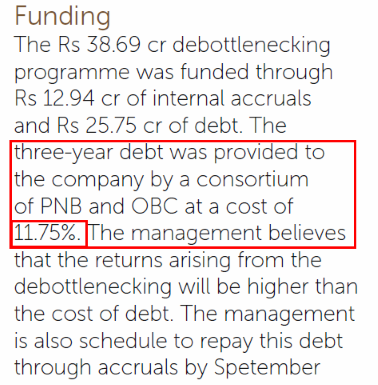 However, the prevalence of debt during the last decade has eaten up almost ₹110 cr from the funds generated by the company during this period, assuming 11.75% rate of interest, which is company is paying on its current debt taken from Punjab National Bank and Oriental Bank of Commerce (FY2016 annual report, pg. 12). 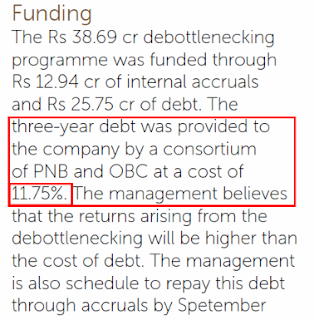 Using the funds generated from operations to reduce debt is a good sign of management. However, if an investor analyses the FY2016 annual report of Ruchira Papers Ltd, then she realizes that there are many aspect/decisions of the management of the company, which require deeper assessment. As per the annual report for FY2016, Ruchira Papers Ltd has paid a salary of ₹3.13 cr to its executive directors including managing director & whole time directors, which is 16% of its net profit after tax of ₹19.5 cr in FY2016. An investor should check with the company whether it has obtained the approval of the central government for paying the stated remuneration to its executive directors. 2) The senior vice president in charge of corporate social responsibility spending (Sr. VP-CSR), Ms. Praveen Garg, who is wife of founder promoter of Ruchira Papers Ltd, is being paid a salary of ₹36.2 lakh, whereas the total CSR spending done by the company in FY2016 is ₹7.47 lakh. 3) The above image also indicates the strange fact that all the eight relatives of founder promoters, are being paid the same salary of ₹36.2 lakh by the company irrespective of their experience (7 to 23 years) or qualifications or age (29 to 69 years). It hardly seems a coincidence as in professionally run organizations, the remunerations of different persons depend on their merit and are usually different for different employees. 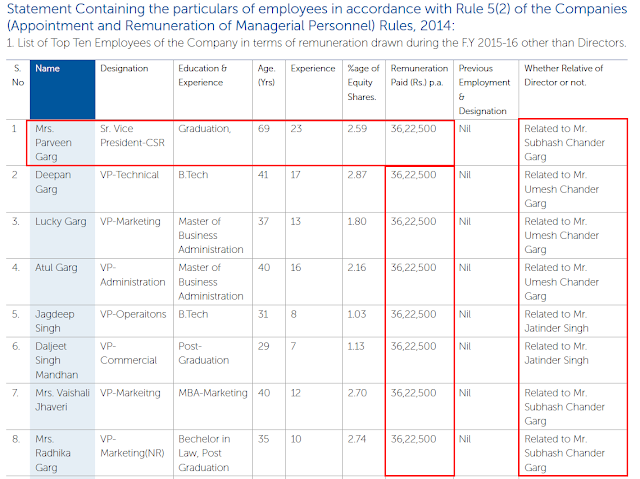 It is very strange performance evaluation by the board/human resource department of Ruchira Papers Ltd that all the eight relatives have added exactly equal value to the company that all the eight of them have received equal increments in remuneration. By a far fledged leap of logic, it seems that the founder promoters are allocating equal allowances to the relatives via the company, which cumulatively amounts to ₹2.9 cr per year (₹36.2 lakh * 8), which is about 15% of net profits of the company. An investor should explore further about the value being added to the company by the eight relatives of the founder promoters. 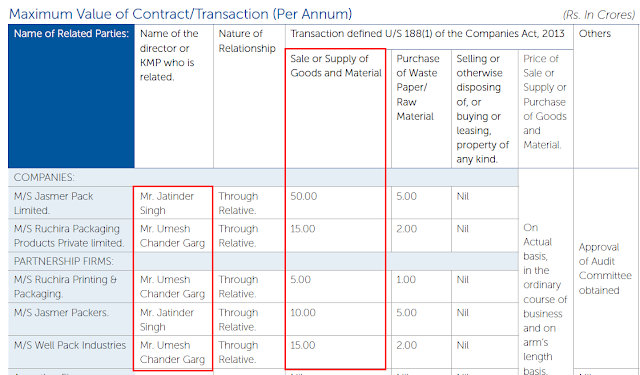 As per the annual report for the company for FY2016, page 32, Ruchira Papers Ltd has been dealing with the entities, which are held by relatives of founder promoters: Mr. Umesh Chander Garg and Mr. Jatinder Singh. The extent of the sales to these entities has been mentioned as ₹95 cr, which is about 25% of the total sales of Ruchira Papers Ltd. An investor should further analyse that whether these transactions are at arm’s length despite being stated so in the annual report. An investor should always be vary of increasing sales/transaction of the companies with promoters and their related parties as historically, such transactions have very high probability of benefiting the said related parties than the minority shareholders. Therefore, it is advised that the investor should explore more about these transactions through various sources and then make her final opinion. Ruchira Papers Ltd is currently available at a P/E ratio of about 9.4, which does provide a margin of safety in the purchase price as described by Benjamin Graham in his book The Intelligent Investor. Overall, Ruchira Papers Ltd seems to be a company, which has been growing at a good pace in the past but is currently witnessing a slowdown in growth. The management has recently undertaken capacity expansion by debottlenecking, which might contribute to the growth in future. The company has been facing fluctuating operating margins in line with changing raw material prices, which is in contrast to the claims made by the company in its shareholders’ communications like annual report. The company has utilized its funds generated from operations in the past to reduce debt and give dividends to shareholders. However, multiple aspects of the management decisions like high salary to executive directors, equal allowances to relatives of founder promoters and significant amount sales transactions with entities of relatives of promoters indicate that an investor should analyse the management aspect of Ruchira Papers Ltd in further depth before taking the final decision of putting her hard earned money in the stock. These are my views about Ruchira Papers Ltd. However, you should do your own analysis before taking any investment related decision about Ruchira Papers Ltd.
An investor should keep a close watch on the operating efficiency and the debt levels of Ruchira Papers Ltd along with its operating margins in future.